This trek is comparatively easy compared to some of the other treks in the region. 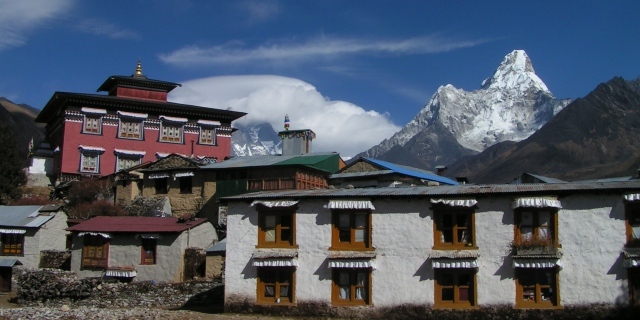 The trek takes you up high along trails to Tengboche Monastery (3850m). Although it is a short trek it provides some great views of the worlds highest peaks including Mt. Everest, Mt. Lhotse, Mt. Thamserku, Mt. Amadablam.The trek starts from Lukla after a 30 minute scenic flight from Kathmandu. From Lukla we trek up to Namche Bazaar and on to Tyangboche (famous for its monastery)then on to Khumjung village the furthest point of our journey for a night before trekking back to Lukla via Phakding where we spend a night. The trek gives a great introduction to the Solu Khumbu region with its sherpa culture as well as providing some fantastic mountain views. The trek is best suited especially for those people who haven’t enough time for longer treks into the high mountains. Day 03 : Kathmandu to Lukla (2804 m.) by flight(40 mins) / trek to Phakding (2610 m). Day 04 : Trek to Namche Bazaar (3535 m). Day 06 : Namche Bazaar to Tengboche (3850m). Today’s route starts / climb up to Shyangboche airstrip / Everest View Hotel a Japanese scheme to build a deluxe hotel with great views of the highest mountains on earth / trail descends slightly to Dudhkoshi at 3250m / steep ascent to Tengboche Gompa / stunning background of Ama Dablam, Mt. Everest and other peaks. Day 07 : Trek to Khumjung village. Overnight at Guest House. Day 08 : Trek to Phakding. Overnight at Guest House. Day 09 : Trek to Lukla. Day 10 : Morning flight back to Kathmandu from Lukla. Day 12 : Transfer to Airport for your ownward destination.